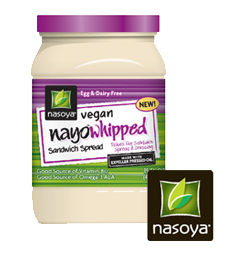 Nayonaise has a new formula that makes this popular vegan sandwich spread better than ever and they have also introduced new Nayo Whipped for those who like a slightly tangier sandwich spread and dressing. Both are Vegan, Non-GMO, made with expeller pressed oil and a good source of vitamin B12. Want to try it? Print a coupon for $.75 off any Nasoya product.